As an HFpack Member, you can support HFpack by wearing an HFpack T-shirt or hat at hamfests or when operating portable. Show your HF spirit! For members, there are HFpack bumper stickers, HFpack radio gear bags, and all the HFpack stuff you've seen HFpackers with in the field, at hamfests, and club meetings. These are now available online to HFpack members. Just a click of your mouse at the Official HFpack Member Store. Over 100 cool items, including clocks, mugs, field notebooks, camo/green stuff, accessory bags, buttons, stickers, mousepads, frequency list stickers, license plate frames, and many other things for your shack or portable operation. Great for gifts... Immediate delivery... fast shipping. 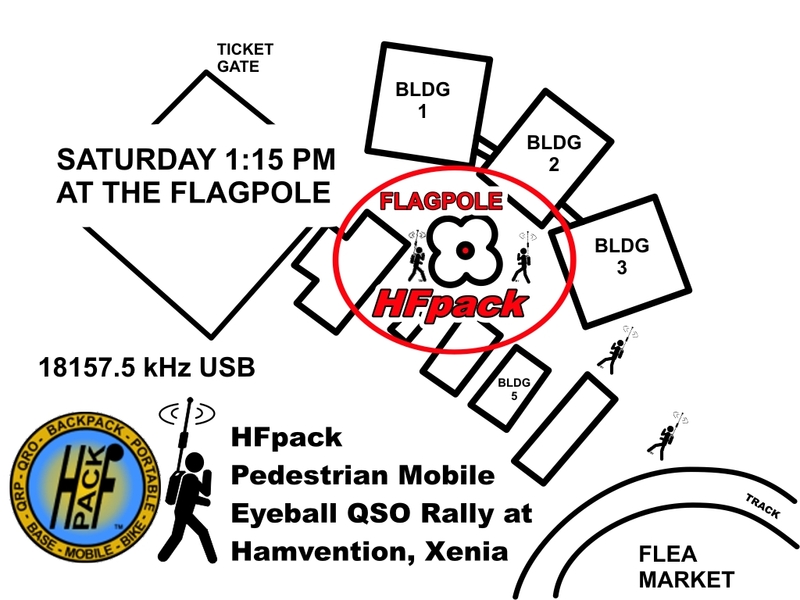 At 1:15 pm local time on Saturday at the Hamvention in Xenia, HFpackers will be on the air for the HFpack Portable Pedestrian Mobile Net. Operators from all around converge on the HFpack Eyeball QSO Rally. For over a decade, HFpack enthusiasts continue to make this the largest gathering of active HF backpack operators in the world. 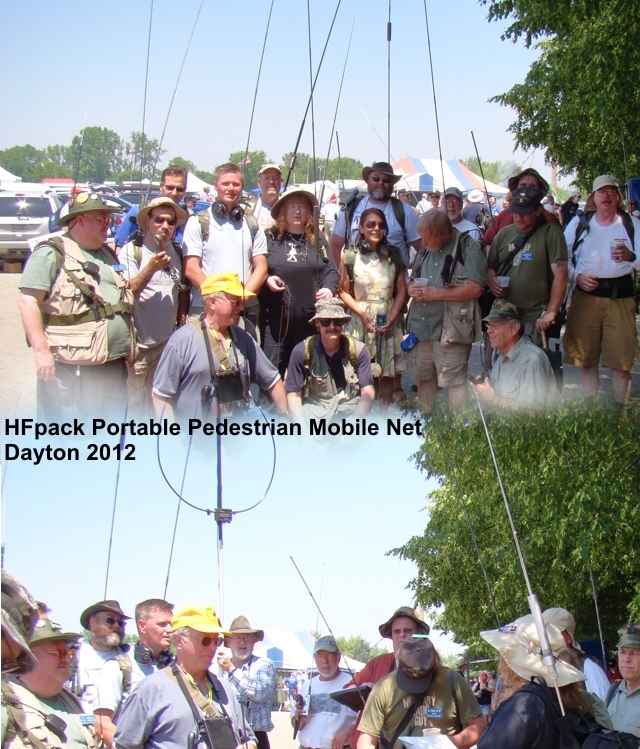 At the annual event in May, the members of the HFpack Portable Pedestrian Mobile Net fire up their HF pack radios again at Dayton Hamvention, for an event that has become internationally known among ham radio operators as the largest gathering of HF backpack operators in the world. During the migration process, you will receive an email from groups.io to set you up on the new server. I hope that you will continue to stay with the HFpack forums through this server transition. Will they gawk at your backpack? Did you know there are several great nets every portable operator can check into on Saturday afternoon at the Dayton Hamvention? Ever worked a bunch of ancient 80meter AM phone HTs? How about classic mil FM 6meter packsets? Enjoy the fun, with the rest of the HFpack group while walking around the flea market on Saturday... Mark KI0PF gives you the inside scoop, in this next article. 12:00 Noon is the AM Net on 3885kc AM. At 1:15PM of course, the HFpack Net is on 18157.5kc USB with Net Out-Of-Control yours truly for this one! If we happen to get hammered by QRM (you never know -- the bands are getting better), we'll use the alternate of 18117.5 USB. At 2:30PM the Cold War Net is on 51.0Mc/s FM. Wideband or narrowband, we'll figure it out. Net control will be John K9WT. This net is primarily for military FM sets (any country of origin) from the Cold War period. Any radio that can hit 51.000MHz on 6 meters with an understandable sig is welcome [such as FT-817, IC-703, or HTs], and the older FM mil stuff is always appreciated. Meet back at Joe's spot (around 3415) afterwards for yet more pix and swapping of lies if yer batteries (camera, radio, and tall-tale) haven't gone kaput by this time. We are now witnessing one of the largest increases in HF portable operators in ham radio history in the past 50 years. The number of hams trying out portable HF is growing rapidly. This is the start of a huge boost to a new generation of HF amateur radio operators... breathing new life into amateur radio for 2012! Many operators and new hams have expressed their joy in finally being able to join the ranks of HFpack on HF, and are planning to take the tests for higher licenses. In the longstanding Amateur Radio and HFpack tradition, experienced HF ops will help and encourage our new wave of HF operators. Let's all show a wholehearted HFpack welcome... on the HF bands, on QRS CW, and with Elmer help on the group forums. Let's make 2009 a great year of growth for HFpack and ham radio! 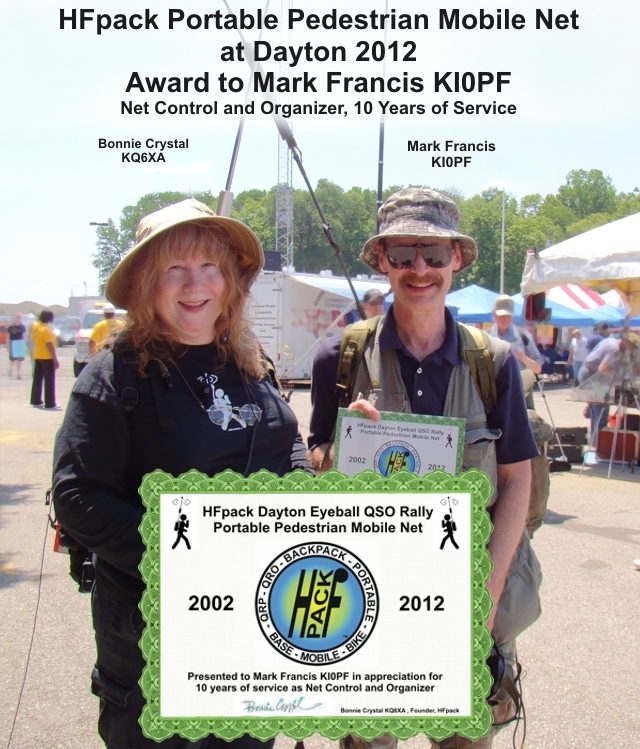 The voice of Mark KI0PF/PM is well known to all operators on the HFpack calling frequencies. Mark has been running the HFpack Portable Pedestrian Mobile Net at Dayton for 10 years, and he was awarded a certificate of appreciation for his service. Bonnie Crystal KQ6XA, founder of HFpack, was on hand to present the award, amidst a cheering group of HFpack members and /Pedestrian Mobile operators. Saturday Night Late... in the dead of the night! "Who knows what lurks in the backpacks of Pedestrian Mobiles ?" Details of what happened at HFpack PACIFICON at the Marriott Santa Clara • Santa Clara, California... As usual, the freqs: HFpack intercom, 144.300 FM Simplex PL151.4 and the HFpack pedestrian mobile HF calling on 18157.5kHz USB were very active. On Friday 14 October the HFpack Annual "No Host Dinner" was held at Bennigans on Great America Parkway with NorCal QRP. The event was arranged by James Bennett KA5DVS. At 1PM on Saturday 15 October, a presentation at the HFpack Forum, "Portable Magnetic Loop HF Antennas" with a Demo was given by Eric Noris WD6DBM. At 2PM Saturday 15 October, the presentation, "Elecraft KX3 and HFpack Lite" was given by by Wayne Burdick N6KR of Elecraft. At 8PM to Midnight Saturday 15 October, the NorCal QRP & HFpack Zombie Apocalypse Night and Hanging Eye Ball QSOs happened, with Vendors, Auction, Show & Tell, and a presentation "Zombie 101 hints " and "How to be a Zombie /PM" was given by Ken Chong WB6MLC. Saturday Night Zombie Apocalypse walking in the dark net was on 40 meters SSB this year, with many pedestrian mobiles roaming the grounds of the event venue with large and dangerous-looking antennas! Ancient Psychic Propagation Predictions came true in 2010-2014! My prediction visionary credentials are humble; as an oracle, I carry the burden of The Transmission Of The Esoteric High Frequency Dharma, having been passed down to me in secret ceremonies through the unbroken lineage of Great HF Oracles, witnessed by The Ancient Order Of The High Frequency Nuns, in the innermost faraday anechoic chambers of the exalted stone observatory overlooking the ionosphere. In our great and long HF journey of lifetimes... having passed our darkest hour in March 2009; having dwelt in the deepest chasm of the second valley of the bottom of Olde Sol 23; from this point into future years of four; we shall venture upward on the Slope of Flux! We shall climb the steep steps of the Mountain Of New Sol 24 together, with ever greater momentum and strength. By the moon of April 2010 we shall reach the average Solar Flux heights of 80 or more! The Fast Tiger of the east shall rise and pounce gracefully upon the waves of 18MHz, yielding a time of spring health among the Strong Portables and Quick Mobiles; The Pedestrians shall play in the meadow again. With each sunset and sunrise, The Pack shall rejoice in the DX of Higher Frequencies, taking leaps and bounds on the trail of double hop. The Guardians of The Towers shall open The High Gates of Ten Metres; The Pedestrians shall tread softly on the sand of the beach in the realm of The Giants of Twenty. By July 2010, the Feeble Bear of the summer west shall obscure the gains of the previous moons; The Portables shall quest for more DX; yet few sweet drops of the Elixir of Great Propagation shall satiate their thirst. Driven from the Highest Bands, The Portables shall again wander the land, seeking nourishment from 14MHz short hops, and taking flight with The Fleeting Bird of trans-equatorial 21MHz multi-hops. In the midst of despair, The Great Clouds Of The Sporadic-E shall unexpectedly appear over the fields, irrigating the planet with ions; strong and powerful voices shall grow, with even the Weakest Of Watts being rewarded on 21MHz and higher! The eager Fast Tiger shall devour the tired Weak Bear. By November 2010, the Warriors and Sages who fought so triumphantly in the Battle of the Plateau shall find victorious comfort in the multi-hop DX gardens of 14 to 24MHz. Having climbed past the Solar Flux of 90, The Pack shall bask in the light of propagation contentment, feasting daily on the green flora of 18MHz. Mobiles and Portables shall roam the hills, exploring even the peaks of 28MHz. Guardians Of The Towers shall breathe easier, having found solace running barefoot through the wide open 5MHz and 7MHz bands; they shall turn their beams on 21MHz; they shall chase the beast of Spectrum Maximus and slaughter whole bands with Split Rare DX Pileups. The Morsepounders and the Digirati shall seek freedom and fortitude in 10MHz throughout the night, and dream yea verily into the dawn of early morning! The Emcomms shall drink ALE from The Chalice Of The High Frequency. Year 2011 shall bring more health to The HF Dwellers. The Pack shall climb to reach the Sol 24 Mountain Peak and summit it in 2014; then light shall shine on all who venture forth into HF Wilderness. The mountain peak shall not overlook the summits of past quests. By 2019 the Sojourners of HF shall descend down the path, and shall wallow in the depths of a deep canyon once again. Only the strong and brave shall remain. ...and so it was written, by her hand, on 17 December 2009. HFpack has become one of the largest fully-moderated groups of this kind in the world. It remains a high quality group because a team of skilled moderators makes it run smoothly and efficiently. Every day, the volunteer moderators read every message posted by members. They approve it, reject it, or clean it up before it goes out to the 8000+ members via email or the web. Moderators process new membership applications, and help members who are having problems with their messages or membership. Such a spammer-free and flame-free group would not be possible on the internet without the watchful eyes of these talented people. All of the moderators on the HFpack team possess a unique combination of technical expertise, HF portable radio knowledge, talent for writing/editing, and even-handed patience for interacting with people. 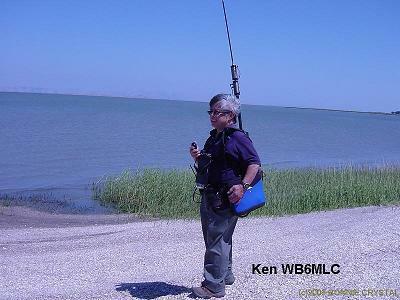 Every moderator is also an active HF portable operator and radio enthusiast. We hope the new Meet the Moderators section of the HFpack website gives you a little insight behind the scenes, into the human beings that make HFpack Group an enjoyable experience. HFpack is the International Resource for Amateur Radio HF Portable - Mobile - Emergency Communications - HF portable antennas. Ham Radio Information Exchange - Nets - Ionospheric Propagation. HFpack is an international news organization. techniques in VHF and HF portable operation. Radio Amateurs are invited to participate in HFpack group forums and on-the-air nets around the world. 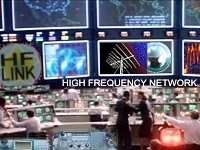 HFLINK is the International Resource for HF ALE Automatic Link Establishment - Ionospheric Propagation Research - High Frequency Communications - Emergency Communications. HFpack, HFpack Insignia, HFpack Logo, HFpack Compass, The HFpack Man, and HFpack Hall of Fame, are Trademarks of HFpack, Inc. All rights reserved. HFLINK, HFLINK Logo, HFLINK ALE, and HFLINK Insignia are all Trademarks of HFpack, Inc. All rights reserved. Capture of the HFpack website or any part of it within the frame of another website is prohibited. All of the the HFpack egroups are private member-only forums. Public archiving of any or all of the HFpack email message groups or web posting groups is prohibited. All text and images on the HFpack website are copyright protected and all images are property of HFpack Inc.
All rights reserved. No part of the HFpack website may be used without direct written permission of HFpack, Inc.
©2017-2000 HFpack, Inc. All Rights Reserved.